This is a bird’s eye view of Berwick upon Tweed. It dates from around 1570. It shows the fortifications built by Richard Lee in the 1560’s. 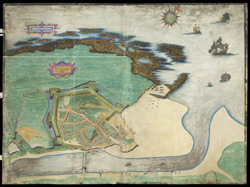 Berwick was taken by the English from the Scots in 1482 and ever since anxiety had been felt about the security of Berwick, although no large scale defence program was embarked upon until the reign of Elizabeth I. Richard Lee was a surveyor who had worked on fortifications at Calais and had gained the reputation as the acknowledged English expert on military engineering. The fortifications shown here consist of a series of five angular bastions linked by a curtain wall and surrounded by a moat.